Construction: On a very warm day - June 30th, I believe - sitting on the back porch, I pulled the Cabaiguan (pronounced cab-eye-wan) out of the humidor and decided to take it for a spin. I was not sure what to think upon first viewing this cigar out of the cellophane. The band was simple unadorned paper (very Cuban) and the wrapper leaf had a strange rumpled mottling appearance...not like the cigar had been rolled wet, but still it looked very unusual. I had been smoking Perdomo Habanos for several months at the time I unwrapped the Cabaiguan so I was used to that leathery look of the Habano leaf. My expectations were not high at this point. Pre-light Aroma and Draw: There was a very earthy aroma to the unlit cigar. Something like soil and leather. Upon clipping the end I was shocked to find a perfect open draw. 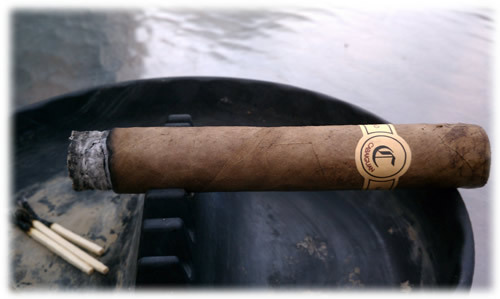 Still, I had something akin to a Romeo y Julietta in mind when I lit it up....boy was I in for a shock. Light and Burn: I had only tried one Tatuaje cigar at the time of this smoke, so I was again shocked by a blast of spice at the opening of the cigar - something I had never experienced before. It was like someone had poked me with a cattle prod. The burn on the Cabaiguan was flawless from start to finish with a solid dark gray ash. Tasting: And here we have the most amazing part. Aside from the construction and burn, I was not expecting the cornucopia of flavors this thing threw at me. Spice at the opening as already stated, followed by a slightly metallic earthy core of tobacco that reminded me so much of a Cuban Cohiba that I could almost smell the ocean and Piñ a Coladas. About mid cigar it started to rain. My first instinct was to abandon my Cabaiguan and go in out of the weather. I actually stood up and started for the patio door when something made me turn around and grab the cigar. We do not smoke in the house so I ran through to the front door at breakneck speed carrying my beloved cigar with me. I then proceeded to smoke another third of it in the cover of the front porch. After about 15 minutes the rain subsided and I again dashed through the house to the shade of the back patio. It was at this time that I was treated to the most unreal flavor profile I have ever experienced in a cigar - in all of the hundreds of them I have smoked . Puffing along happily at the Cubanesque gem I had found, my eyes went wide as the unmistakable flavor of yellow cake crossed my palette. It lasted for about six or eight puffs, each followed by an exclamation of disbelief. 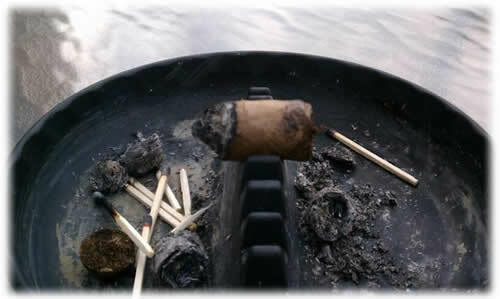 As you can see from the photos below....there was only about an inch of this cigar left when I put it out....And it left a sadness in my soul to do so. This, my friends, is what smoking cigars should always be like. Value: At just over $8 the Cabaiguan is priced right.....honestly for the experience it gave me I would have gladly paid a lot more! Final Thoughts: Hands-down one of - if not THE - best cigar I have ever smoked. Highly recommended a thousand times over.